...Because a Lisa Party happens approximately once a decade. Yes! After all my hard work to whip the apartment into shape for myself (and fully embracing the solitude life of a basement dweller), I did a 180 and invited a dozen-plus people into my home. Voluntarily. But it was pretty fun! At least, I had fun. And that's what matters. In addition to loading up on food and booze beforehand, I made some other changes to the apartment. Let's see. 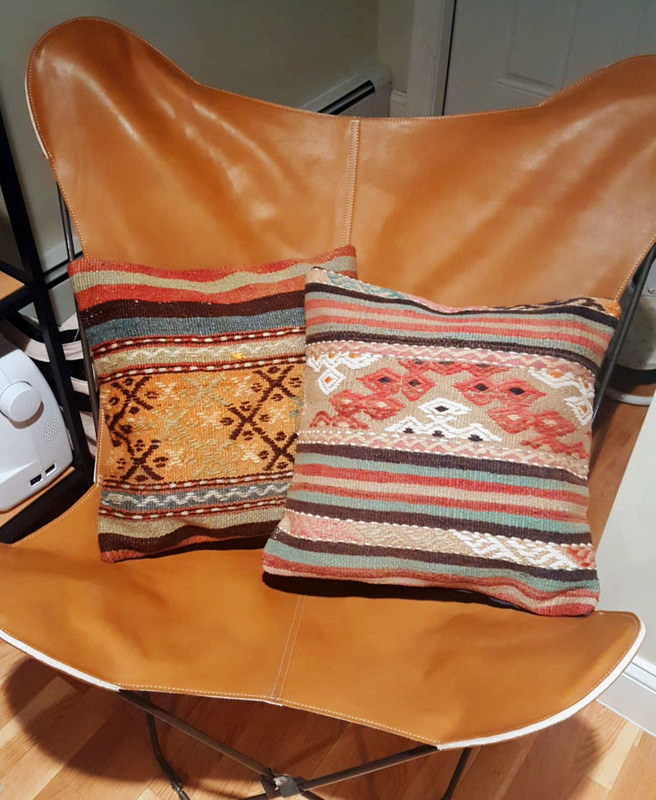 I do feel happy while using my pillows, but I will note that these are mostly decorative — you're not going to be snuggling up with them any time soon as they're quite scratchy on the woven side. I also picked up this larger one from H&M on the off-chance that I DID get the urge to snuggle up with a pillow sometime. (Hey, hangovers happen.) H&M's stuff is pretty hit or miss, but I like the material and simple pattern on this one. Plus, their pillow inserts are cheap. I know now to stick to only the cheapest, hardiest of plants, so I made stops at Home Depot and Trader Joe's for some basic green. The "tropical" plant above and my snake plant are both still kicking more than a month later, but I know better than to get complacent...they'll probably die soon. But my zizi plants are still going strong! These have been with me since my last apartment. When my fiddle-leaf fig tree bit the dust, I transferred my two zizi plants into the big pot so I could once more have something decent next to the bed. This picture might be awful, but look how great that plant is surviving! Sidenote: If anyone knows how to succeed in taking good pictures of a basement apartment, please do share. I think my #1 barrier to posting more is a lack of decent images to accompany all this word garbage I have no problem spewing. Yep, I bought a rug. Probably wasn't necessary, but now I can officially refer to this tiny square of space as the "living room." Plus, my secret favorite thing ever is stalking products and snatching them up the second they go on sale, which is what happened with this rug after it had first sold out for a couple months. It's a simple flatweave with a printed pattern, so nothing fancy, but I wasn't looking for a forever rug and I dig the design. I've been assured that it's not too much black/white/gray in one space, but if you disagree...please don't tell me. Actually purchased after my party, but whatever. Also, guess what? Pretty much no one sat down while they were here, anyway! All that loveseat drama WAS FOR NOTHING. JK. I love my loveseat and it brings me great joy. It allows me to partake in one of my favorite activities: comfortably eating in front of the TV. Back to the chair. I've wanted this chair for, oh...maybe four years? At least? Not really sure why, since a solid number of people have told me just how uncomfortable they think butterfly chairs are, but I'm a fan, personally. I also prefer to sit cross-legged whenever possible and am one of the first to plop down on the floor in meetings, too, though, so...don't judge it based on my opinion. But what I can say unequivocally is that it's a smart choice for a studio apartment, because I can fold it up and tuck it away when it's not in use/blocking the way to the laundry/whenever I feel like it. Points for practicality! It was, however, expensive, and there was no getting around that, though I did manage to buy it while it was on sale for one of the only times in the past several years, so I can at least tell myself that. Also, I had picked up the frame in the clearance section for $10 about a year ago and have been hoarding it for this very moment, so, pat on the back, Past & Present Lisa. Whatever. I'm alone in the world and only have myself to spend my money on. Let's splurge! That's it for now. I will say one more thing about hosting people in your home, though: a certain someone may have scoffed at the idea of include carrot sticks and hummus as part of my snack spread, but they went like HOT CAKES. I also cannot recommend enough making a couple simple pizzas to anchor the food situation — it's a low-stress, affordable, and delicious option. And they're easy to jazz up and seem fancy, too. Yeah, I'm basically an expert hostess now. Per usual, the end of the year means I fall off the blogging planet. But time hasn't stopped in the real world, and I actually managed to make some more additions to the apartment to make it feel less like an empty basement and more like my new home. Voila. It was an easy switch to make, and while it's mostly covered up with my stuff on the shelves, I much prefer it. You can choose to stain the wood, but I opted to just apply some Feed 'n Wax since I liked the light color. Note that I've simply placed the thin plywood on top of the existing glass shelves so I still have as much support as possible; you can certainly choose to replace the glass shelves with wood completely, but you'll need to choose thicker plywood and may also need to add additional support so there's no bowing. This is what life looks like when you have zero storage. I originally thought I'd use the bookshelf as a divider between the bedroom and living spaces, but that was causing issues with placement of the dresser, and eliminating the possibility of a loveseat (one day...I will find you...), so: screen. I'd had it bookmarked on Urban Outfitters since before I even moved, watching and waiting for the price to go down. When it finally did (70% off, thank you very much), I knew it was time to pounce. Fun facts: The original placement of the hinges didn't allow for it to open quite as wide as I had wanted, so I repositioned them with the help of my dad when he was visiting. Also, the floors in my apartment are so wonky that when I walk past my bed, they move up and down enough to make the screen wobble alarmingly. My solve? There's a loop of fishing line going from the top of the frame to around the pipes above. It sounds super sloppy, but I honestly can't even see it 99% of the time. And now I don't need to worry about the screen falling and crushing me. Step Three: Enter the potato table. I don't like desks. I don't like sitting at them. I don't like working at them. But I knew I needed, at the very least, some extra surface area for writing, using on my laptop, and — let's be honest —placing my crap. I was about to cave and buy something new from Target or IKEA when I came across this fun, weird table on Craigslist. It's supposedly a table from the 1920s that was built with the express purpose of storing potatoes (see how the lower drawers have metal bottoms, and are crazy deep?). It's beat-up, scratched, a little bit rusty...and I really love it. I made my friend Jamie come with me to pick it up, and I think she was expecting me to have some grand plans for painting or refinishing it. Nope! We also came across an estate sale on our way home and discovered the most terrifying collection of dolls I've even seen in my life. So, y'know, bonus. Step Four: Hang some artwork. Step Five: Get something green. It's a fiddle-leaf fig plant (courtesy of my mom), and against all odds, it's actually GROWING. This has never happened to me in my life. One last thing of note: I now own a TV for the first time in six years. Everyone in my family's like "it's about time." And that's about it for now. More updates later if my loveseat dilemma ever gets solved. It's May, and that means that I've officially waited long enough to pretty up the balconies. Last year, I jumped the gun and put out the flower boxes before Easter, and they ended up frost-bitten, windblown, and then — if that weren't enough to survive — baked to a crisp in the hot summer sun. Sorry, guys. I've been told May 1st is the all-clear date for spring planting, so last Sunday I got down and dirty. The front's shaping up nicely; I just need to revive my popcorn tin planter and fill it with some herbs, and refill Nathan's lonely feeder with some birdseed. The back is a bit of another story: the furniture I carefully (read: hastily) acquired from a series of Craigslist scores is looking a little worse for wear after sitting outside all winter. In my defense, I huddled everything together under a tarp that was then weighed down with some bricks, so they weren't completely exposed to the elements. But the paint on the chair that sucked up so many hours of my life last summer is already starting to brush off, and those metal stacking tables have some serious rust edge. OH WELL. I'm happy to focus more on the little things: some replacement bulbs for all the ones I broke last year, a handful of legit outdoor pillows and cushions, and maaaaaaybe some hanging planters. Who knows. I've got three months of well-lit summer nights ahead of me to fill with tinkering and rearranging. Maybe I'll even invite people over to enjoy it. Stranger things have happened.